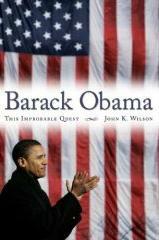 Click here for 36 full quotes from Barack Obama in the book This Improbable Quest, by John Wilson. The author, John K. Wilson, was a student of Obama's, while Obama was teaching at the University of Chicago Law School. Wilson clearly admires Obama, but the book is not hagiography -- it addresses the serious issues that Obama faces about his personal past and his voting record. It's a solid analysis from a pro-Obama perspective -- useful for Obama fans who want to respond to legitimate criticisms. It's not so useful for those who are anti-Obama -- if Obama goes further, books for them will follow. The content of the book addresses several key issues that have followed Obama's campaign: race, experience, religion, and the few scandals that have plagued Obama. The book also addresses the "Generation Obama" aspect of the campaign -- his appeal as the first Gen-X** candidate among young people and the blogosphere. The title of the book comes from Obama's speech announcing his presidential candidacy, in which he invited supporters to join him on "this improbable quest." If Obama ever wins the presidency, that phrase could become his slogan. * We cover two other books about Obama: Should Barack Obama Be President? and Hopes and Dreams, but both are just introductory -- quick-published books which introduce the candidate without the depth offered here. Voted against banning partial birth abortion. Rejects free market vision of government. Include class-based affirmative action with race-based. Decisions about marriage should be left to the states. Homosexuality no more immoral than heterosexuality. Pushed Illinois bill to videotape all capital interrogations. No extra penalty for gang association. Not first candidate to use drugs, but first honest about it. 2001: questions harsh penalties for drug dealing. Organized inner-city recycling; fought environmental racism. No Obama Doctrine; just democracy, security, liberty. Wrote 2006 law stabilizing Congo with $52M. Public submits policy ideas on Obama�s �My Policy� website. Reduced cost TV ads for candidates; $85M presidential limit. 2000: cosponsored bill to limit purchases to 1 gun per month. Added 20,000 children to Illinois healthcare. Judgment is as important as experience. If attacked, first help victims then prevent further attacks. 2006: Obama-Lugar bill restricted conventional weapons. First major politician of the post-Baby Boom generation. Community politics: merges Alinsky & political activism. Registered 150,000 young Chicago area black voters in 1992. Criticizes voter cynicism from decades of disappointment. On �inexperience�: he wrote policy books that media ignores. Real estate deal with felon was �boneheaded� but ethical. Veiled racism in dismissing Obama as �unqualified�. Bradley effect: black candidates poll above actual votes. Madrassa myth perpetuated by false email & fabricated story. Apply lessons from both Goldwater and McGovern. Uses prayer to take stock of his moral compass. Invites supporters to join him on �This Improbable Quest�. Resolve �most electable� vs.�most progressive� by being both. Trillion dollar giveaway: the Paris Hilton Tax Break. Organizes campaign events via MySpace.com and FaceBook.com. 2002: I don�t oppose all war; I do oppose dumb war. 1980s: Director of the Developing Communities Project. This Improbable Quest, by John K. Wilson.